Noting some 2,700 opioid-related deaths in the state in the past three years, Oklahoma Attorney General Mike Hunter has established a Commission on Opioid Abuse. The Commission will focus on prevention, intervention, education, treatment, law enforcement and rehabilitation with the goal of releasing its findings including recommendations for potential legislation prior to the opening of the next session of the Oklahoma Legislature. Attorney General Hunter will chair the commission with members appointed by him, Governor Mary Fallon, House Speaker Charles McCall and Senate President Pro Tempore Mike Schulz. Shanethia Collier, DDS, Private Practice. Terri White, Commissioner of the Department of Mental Health and Substance Abuse Services, is an ex-officio member. Effective November 1, 2017, it will be against the law for Oklahoma physicians to prescribe opioids via a telemedicine encounter. The law allows physicians to prescribe opioid antagonists or partial antagonists for telemedicine patients. Oklahoma Governor Mary Fallin signed the measure enacted during the 2017 Session of the Oklahoma State Legislature. The bill was co-sponsored by State Senator A.J. Griffin, R-Guthrie, and State Representative Glen Mulready, R-Glenpool. All telemedicine and store and forward technology encounters must comply with the Health Insurance Portability and Accountability Act of 1996 (HIPAA) ensuring that all patient communications and records are secure and confidential. A valid physician-patient telemedicine relationship exists when the physician holds an Oklahoma medical license; confirms with the patient the patient’s identity and physical location; and provides the patient with the treating physician’s identity and professional credentials. Malpractice suits, licensing board investigations and sanctions are no longer the only legal concerns facing physicians accused of aberrant medical practice. Legal authorities have become more aggressive in pursuing criminal charges against doctors. In Oklahoma, Attorney General Mike Hunter has charged a Midwest City osteopathic physician with five counts of second degree murder in relation to the deaths of at least five (5) patients. The probable cause affidavit says the doctor knowingly prescribed controlled dangerous substances (CDS) to patients without a legitimate medical need, in quantities and circumstances that are considered an extreme disregard for human life. The Oklahoma Medical Examiner’s Office reported all the deaths were the result of multi-drug toxicity. The five victims were prescribed more than 1,800 opioid pills in the months of their deaths. Three of the deceased were prescribed a three drug combination of an opioid pain reliever, an anti-anxiety drug and a muscle relaxant. Oklahoma Bureau of Narcotics and Dangerous Drugs Control (OBNDD) Prescription Monitoring Program (PMP) records indicate that between 2010 and 2014, the physician prescribed more than three million doses of CDS. The Oklahoma State Board of Osteopathic Examiners has rescinded the physician’s CDS prescriptive authority and the doctor voluntarily surrendered prescription credentials to the Drug Enforcement Agency and OBNDD. If convicted, the doctor faces up to ten years in prison on each count. In Dallas, a 45-year-old neurosurgeon recently received a life sentence after being convicted of a first degree felony for harming a patient during an operation. A Grand Jury originally indicted the physician on five counts of aggravated assault with a deadly weapon and a single count of harming an elderly person. At trial, the District Attorney chose to prosecute only the latter charge. The case is unique in that it is extremely rare for a physician to be indicted much less convicted for the quality of care the doctor provided. The prosecution had to prove that the physician’s care was below generally accepted standards and the doctor knew what he was doing or was aware that he was likely to cause harm and proceeded anyway. The surgeon had a track record of substandard outcomes. During the trial and sentencing phase, the prosecution called over thirty witnesses who had been injured by the physician. The defense argued that the physician, an Alpha Omega Alpha medical school graduate who completed a university-based neurosurgery residency program, may have been a poor surgeon but did not knowingly harm patients. The one physician-expert witness called by the defense cited “utter failure of the entire system of checks and balances for patient safety,” noting the history of issues the accused doctor had with a residency program, licensing board, hospital credentialing, etc. The argument did not sway the jurors. The nation’s ever-increasing opioid abuse crisis has prompted federal agencies to target and make examples of physicians, pharmacists, hospitals and others who handle opioids, according to Oklahoma’s Crowe & Dunlevy Criminal Defense, Compliance & Investigations Practice Group. The federal Department of Justice (DOJ) and U.S. Attorney General Jeff Sessions recently announced the formation of an Opioid Fraud and Abuse Detection Unit pilot project to combat healthcare fraud. The Unit reportedly will use enhanced metrics to trace and identify doctors and pharmacists who appear to be opioid prescribing outliers. DOJ also said it will begin to place specially assigned prosecutors in various states to investigate aberrant prescribers and prescription fillers. Simultaneously, DOJ will continue to pursue civil and criminal actions against companies which fail to report suspicious opioid activity. In addition to DOJ activity, the U.S. Food and Drug Administration, U.S. Department of Health and Human Services and other federal agencies also have their own anti-opioid abuse initiatives. While Oklahoma physicians and pharmacies have experienced similar scrutiny from state and local authorities for the past several years, the ongoing opioid abuse crisis may cause state and federal law enforcement and regulatory agencies to be more aggressive in filing civil and criminal charges. Oklahoma physicians are reminded that state law requires them to document they have checked with the Oklahoma Prescription Monitoring Program (PMP) before writing a Schedule II prescription for any new patient and every six (6) months for established patients. Physicians with further questions about potential opioid targeting may contact Elizabeth Scott, Sanford C. Coats, Thomas B. Snyder or any other member of the Crowe & Dunlevy Criminal Defense, Compliance & Investigations Practice Group. Maintenance of Specialty Certification (MOC) is not a condition for obtaining or keeping a medical license in Oklahoma. While MOC is not required for licensure, physicians are reminded that the Allopathic Practice Act does mandate completion of sixty (60) hours of Category I Continuing Medical Education every three (3) years for license renewal. Physicians must attest to CME completion on license renewal forms. The Oklahoma Board of Medical Licensure and Supervision audits randomly selected physicians to confirm CME attestations. The Medical Board accepts as CME verification: AMA Physician Recognition Award; specialty board certification or re-certification by an American Board of Medical Specialties during the past three (3) years; proof of residency or fellowship training during the past three (3) years; or copies of Category I CME completion certificates. Failure to submit verifiable records when requested constitutes an incomplete renewal application and at least temporary inability to practice. A license obtained or renewed through misrepresentation will result in Medical Board action. Oklahoma physicians may now supervise up to four (4) Physician Assistants (PA) at any given time. The provision is part of a major update of the rules pertaining to the practice of PAs contained in the Oklahoma Administrative Code 435, Chapter 15, which is available on the Medical Board’s website, www.okmedicalboard.org, on the PA page. Other updates to the rules provide more flexibility for physicians and PAs. Doctors may continue to supervise PAs via telecommunications visits and now may define the scope of their PA’s practice. PAs may practice immediately in rural areas rather than waiting one year as required in the past. The amended PA Practice Act also empowers the supervising physician to define “newly diagnosed complex illness” for which the PA must contact the doctor within 48 hours. Two things have not changed. 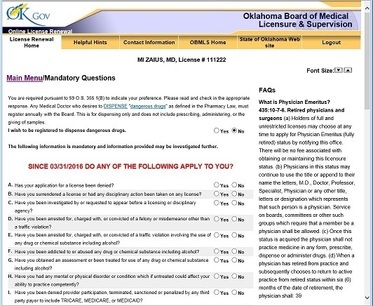 The supervising physician is still ultimately responsible for the care provided by PAs and the supervising physician cannot be an employee of the PA.
Oklahoma physicians, and all other practitioners licensed by the Oklahoma State Board of Medical Licensure and Supervision (Medical Board), are reminded to personally review all license renewal forms before signing and submitting them. This is particularly important for the busy practitioner who may delegate completion of the form to support staff. The licensee is totally responsible for all information ultimately included on the renewal form. If an answer is marked “No” but the Medical Board discovers through other sources that the answer should have been “Yes,” the problem is with the licensee NOT the person who completed the form. Defending a fraudulent application is not only embarrassing but can also be expensive. Practitioners are encouraged to complete the electronic license renewal themselves to ensure accuracy or make a copy of the renewal form, personally answer the questions then review and sign the document before handing it to a staff person for filing. Physicians must renew their licenses annually. The questions on the renewal form apply to activity during the past year only. Click on licensee name link for details. License suspended for 60 days effective March 6, 2016 through May 4, 2016. Placed on 3 year probation effective from the date of the filing of Order. Licensee shall not prescribe controlled dangerous substances during his probation. Wellston, Suspended 30 days, Ordered to pay $5000 fine, shall attend 2 separate continuing education courses, one each on ethics and prescribing with in 9 months after effective date of Board Order. Oklahoma City, Voluntary Surrender to Jurisdiction, Licensee is ordered to pay $4500 fine and is barred from ever reapplying for a medical license in the State of Oklahoma. McAlester, Board and licensee agree that the licensee will not reapply for licensure in the State of Oklahoma, will receive a public reprimand, and will be assessed an administrative penalty of $42,500 to be paid in full within two years. Tulsa, License suspended for 1 year, ordered to pay administrative fine of $25,000, and licensee is required to appear before the Board in one year for review. License suspended for 6 months, required to pay $10,000 fine, obtain mental health assessment, complete CME courses on prescribing and documentation, and appear before the Board in 6 months for review.